Residents, who fought off state plans to sweep the camp at the Waianae Boat Harbor, want to create a new self-made village for up to 300 homeless people. Members of Hawaii’s most well-established homeless encampment near the Waianae Boat Harbor are moving forward with plans to lease or buy land in Waianae to relocate their community of roughly 200 people. Land and infrastructure, including electricity, sewage and water lines are estimated to cost $1.5 million, according to Waianae resident James Pakele, who is working with the community on relocation plans. Pakele and Twinkle Borge, the camp’s leader, are working with Natalie Snyder-Pond and Michael Hodge to design a village modeled after a Hawaiian kauhale, a group of houses with communal areas for cooking, eating areas and in this case, bathing. Correction: An earlier version of this story misidentified Hodge and Snyder-Pond as architects on the project. They were acting as design consultants. 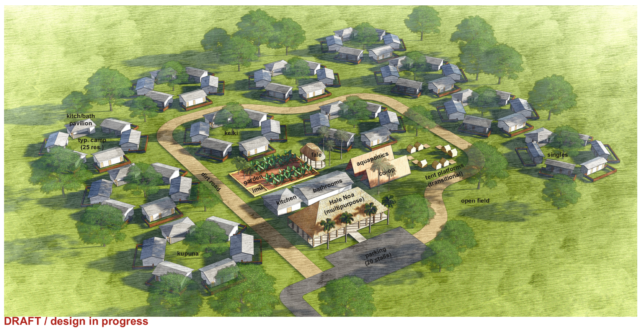 Architects Natalie Snyder-Pond and Michael Hodge created a rough draft of a village based on the Hawaiian kauhale communal living design. There are no plans yet for how to build and pay for the actual houses. For more than a decade, people have lived in tents and makeshift structures on undeveloped land owned by the state Department of Land and Natural Resources. The encampment, Puuhonua O Waianae, has developed into a self-governed community that state and local lawmakers have cited as a potential model for homeless safe zones in other parts of the state. 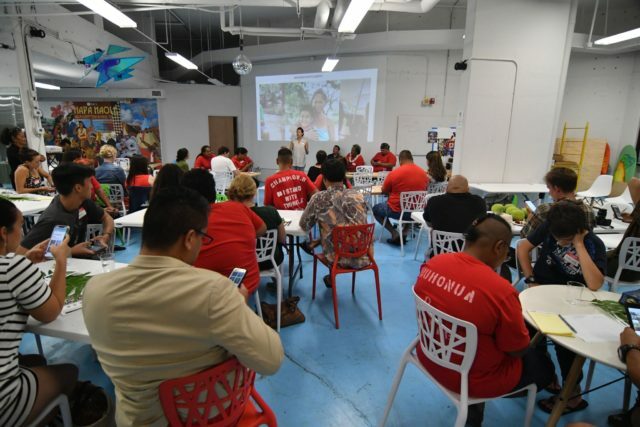 A group of people who live in the encampment and their supporters met Saturday night at Impact Hub in Kakaako to launch a three-month fundraising campaign. Borge, Pakele and Puuhonua supporter James Koshiba explained their plans to a group of about 30 people, who then brainstormed ways to improve the presentation. 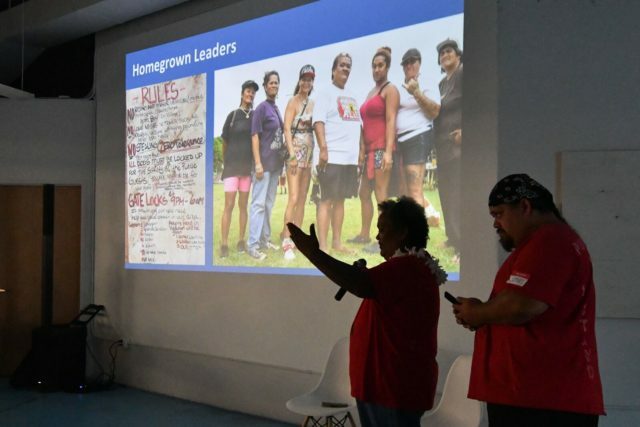 “It’s not Housing First, it’s not jobs first, it’s community first,” Pakele said to the crowd, suggesting that a self-made village is a more suitable solution to homelessness for the Waianae encampment than the state’s strategy of Housing First, which aims to quickly get homeless people into permanent housing. In March, state officials announced plans to sweep the encampment only to have Gov. David Ige contradict them days later. Ige said the state has no imminent plans to sweep the encampment and is looking for land in Waianae suitable for relocating the homeless village. The announcement caused upheaval in the encampment and caused its supporters to double down on relocation efforts. Twinkle Borge and James Pakele presented plans for relocating the Waianae Boat Harbor homeless camp to a group of about 30 people Saturday night. Courtesy of Puuhonua O Waianae. Borge wants to relocate the village by the end of 2019. Read Civil Beat’s special report about the Waianae Boat Harbor homeless encampment. State homeless coordinator Scott Morishige and DLNR officials are working with the village leaders to identify land. The group narrowed down a list of a few parcels in Waianae but declined to identify the parcels, citing concerns that making the list public would jeopardize the group’s ability to lease or purchase the land. “We don’t want to hamper our ability to negotiate,” Pakele said. Borge and Pakele also said they would prefer to buy land to avoid uncertainty that can arise once a lease agreement with the state expires. A few anonymous donors have already dedicated up to $500,000 in a “challenge grant,” meaning the money won’t be available until it is matched dollar for dollar, Koshiba said. The camp’s leaders also plan to reach out to the Office of Hawaiian Affairs, the Queen Liliuokalani Trust, Kamehameha Schools and other organizations that support Native Hawaiian causes for funds. Most people who live in the village are Native Hawaiian. Organizers Saturday night launched a website for their crowdsourcing campaign and also plan to hold events, dinners and fundraisers. “It would be a herculean effort if we can pull this off,” Hodge said. Puuhonua organizer James Koshiba asked a group gathered at Impact Hub to take out their phones and visit alohaliveshere.org, and share photos of Puuhonua O Waianae on social media. Small homes where people live might not have indoor plumbing, but shared bathrooms and kitchens would cut down on costs dramatically, Pakele said. Village residents would all pay for utilities, including trash pickup fees and wastewater fees. “We’re trying to come to an arrangement that’s truly, honestly affordable,” Pakele said. The number of people living at the boat harbor encampment fluctuates between 200 and 225 as homeless people come and go, but a core group remains. The new village would accommodate up to 300 people. 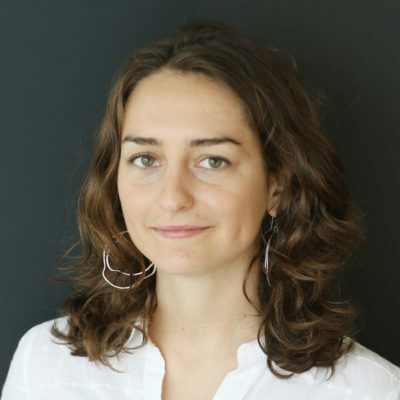 Homeless people swept from other parts of the island often end up at Puuhonua, so Hodge said they would incorporate an area for people coming in right off the street. The Legislature last session dedicated $30 million to create six safe zones, three on Oahu and one each on Maui, Kauai and the Big Island. The governor’s office controls those funds and as of August had not released any.